I thought God would heal me at that healing service for everyone to see. I thought God would restore my marriage by changing my husband's attitude. I thought God would restore my finances by giving me this new job opportunity. I thought that this was going to be the trial that God used to bring my child closer to Him. We read about a man named Naaman in 2 Kings chapter 5 and his struggle with this very topic. Naaman was a well-respected commander in the army of the king of Aram. He was a great soldier, but was tragically stricken with leprosy. Naaman heard about this mighty prophet of God in Israel, Elisha, who could cure his disease. Desperately in need of a miracle, Naaman traveled to the house of Elisha and received something different than he expected. Instead of Elisha putting on a spectacular display of healing, he didn’t even meet with Naaman. Elisha simply sent a messenger in his place with instructions for Naaman to go wash himself in the Jordan River sevens times. If he did this, Naaman’s flesh would be restored. But Naaman went away angry and said, “I thought that he would surely come out to me and stand and call on the name of the Lord his God, wave his hand over the spot and cure me of my leprosy”…So he turned and went off in a rage. All too often, we allow our thoughts and ideas to interfere with God’s plans. We think we know what the best method is to answer our prayer request. Unfortunately, we can sometime miss God’s intervention simply because we expect it to look a certain way. Naaman’s servants went to him and said, “My father, if the prophet had told you to do some great thing, would you not have done it? How much more, then, when he tells you, ‘Wash and be cleansed’!” So he went down and dipped himself in the Jordan seven times, as the man of God had told him, and his flesh was restored and became clean like that of a young boy. If Naaman’s servant hadn’t encouraged him to obey these instructions, Naaman would have missed his miracle. How sad! Ladies, I want you to reflect upon the situations in your life that you are praying over. Are you missing your breakthrough because you don’t like the way God is answering it? We need to stop fashioning God into how we think He should operate and trust that His ways are always best. God can accomplish His purposes through many methods. Stop limiting Him by your own thinking. ------------------------------------------------------------------------------------------------------ We hope that you will be able to join us for the "Taking Every Thought Captive" Conference on Saturday, September 19th from 9:00 a.m. - 3:oo p.m. We expect it to be a refreshing time for all women. Special Guest, Amy Carroll, from Proverbs 31 Ministries, will be speaking that day about her new book, "Breaking Up With Perfect." Tickets are $35. Go to eventbrite.com to get your ticket today. As I have confessed in previous blogs, I am a planner. So it was a complete shock to my husband and kids when I suggested blowing off perfectly good airline tickets to instead embark on a road trip. We were hours away from flying home from Florida when I suggested this spontaneous detour. My husband’s grandfather lives in Alabama, so it seemed like a perfect time to visit with him. From there, we would drive back home to Connecticut in our rental car. Although my kids thought their mother had temporarily lost it, they were genuinely excited that we were extending our vacation with an extra adventure. But, after several hours in the car, the all too familiar “are we there yet?” started to resound from the backseat. To be completely honest, it started to come from the front seat too. The first leg of the trip wasn’t so bad. It was short. We were comfortable. However, after the first stop in Alabama, the trip started to drag on, and we began to get a little impatient. Interestingly, I find myself on a little “road trip” of my own right now. I’ve been waiting on the Lord for almost a year for a specific situation in my life. I have complete confidence that the Lord will fulfill His promises to me, but I too am getting a little impatient. Lately, I find myself asking God, “are we there yet?” Today is one of those days. 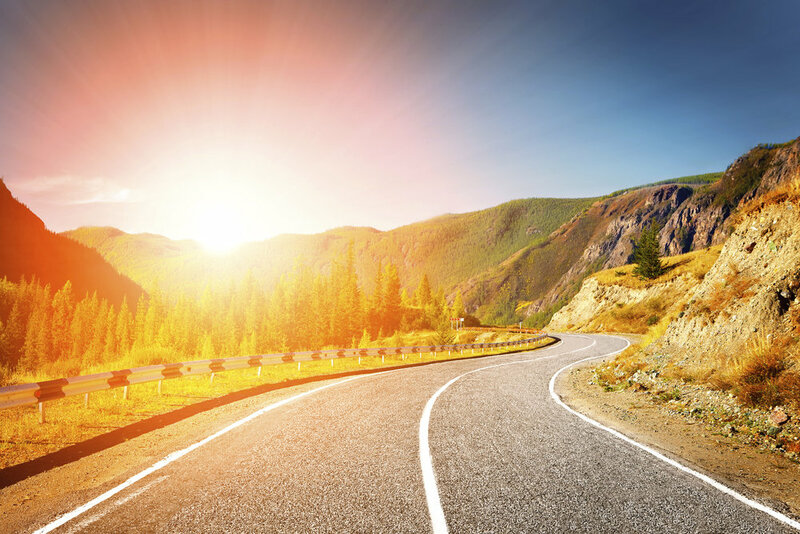 Although the Lord’s timetable is slower than I would like, I have come to recognize that the Christian life is made up of a lot of “road trips.” All too often, our sole focus is to get to the destination rather than growing during the journey. Not to sound cliché, but the journey is as valuable as the destination. Yes, the journey may be filled with moments of pain, disappointment, and uncertainty, but God allows us to go through it with a purpose in mind. You see, during these moments of waiting, God is calling us to draw closer to Him like never before. It’s during these times that we learn to trust the Lord in a new, deeper way. We must trust Him even if the journey we are on doesn’t seem fair or beneficial. If you are on one these trips, ask yourself these questions. Why did God put me on this path? What area of my life is He trying to stretch or grow? Who else can I bless along this journey? Do I trust Him completely even though I can’t see the final destination? Ladies, it is important to make sure that we take our foot off the gas from time to time and stare out the window for a few minutes to truly see what God has in mind for us. Once you start to see His purpose, you may actually begin to enjoy the ride. God, do you even hear me or is it that you just don’t care about me? I realize that these trying times certainly can be discouraging. I understand. I have been there. But in these moments, we need to draw into God like never before. We must continually remind ourselves that, with God, there is always purpose in every situation, even if we can’t see it. Do we dare live outside our understanding and trust Him unconditionally? When my faith begins to waver, and my heart becomes overwhelmed, I cry out to the Lord, and He answers me with His Word. I am reminded that I am not alone in this battle. He is always with me. All I know is that God loves me dearly. He obviously has a purpose for the challenges I go through. Once you truly grasp Christ’s love for you and that He has a perfect plan for your life, you will have peace knowing He is in control. New England weather is quite erratic. One morning you have the heat on and that same afternoon you need to turn on your air conditioning. So it is no surprise to us when a November snowstorm heads our way. When those newscasters start mentioning snow, we New Englanders know exactly what to do. Get gas for our snow blowers and generators, de-icer for the walkway, and of course, bread and milk, just in case we are stuck in our house for days, which incidentally never happens. Proper preparations are necessary for weathering any storm. Most of the time, like this recent storm, we get by quite easily. But every so often, we get clobbered with a doozy of storm, and we are very thankful that we took care of all the necessary preparations. It doesn’t matter if it’s an ice storm, blizzard or hurricane; those who are ready pass through them all with confidence and peace. In the same way, the Christian life requires preparation. You can never know for sure when a storm will show up on your radar screen. Much like the weather in New England, life is unpredictable. I can assure each of you that storms will come and go. The question to ask yourself is how can you prepare properly for the ups and downs that life presents? The best way to prepare is to ensure that our foundation is on the rock. That is, our foundation is on Jesus. Ladies, we need to spend time in prayer and in the word of God every day. The Bible is full of testimonies of God’s faithfulness toward those who love Him. Time after time, we see God’s mighty hand deliver His people from all sorts of trying circumstances. He delivered Daniel from the lion’s den; He healed the woman with the issue of blood; and He rescued Paul from the shipwreck. We need to learn how to meditate on His word so that we are steadfast and unshaken when a storm hits. His word tells us in Philippians 4:6-7 “do not be anxious about anything, but in every situation, by prayer and petition, with thanksgiving, present your requests to God. And the peace of God, which transcends all understanding, will guard your hearts and your minds in Christ Jesus.” Our hearts and minds need to be in alignment with God. This can’t be done while the storm is brewing. We need to spend time preparing before the storm arrives. I received a phone call last week that could have shaken me. Instead, my heart was prepared and full of God’s promises, which combatted the effects of that news. I was able to see past that moment, and into the future, confident of what God has ahead of me. For you see, when you are aware of the fact that God is in control of your life and loves you, there is nothing that can shake you. The storms will not beat you down.